This is far from ground-breaking, but could be a nice diversion for other ISWAK/PK fans. I binged my way through the first five episodes over the past day, and am ready to declare it an easy-to-watch, albeit overly-familiar piece. This is also my first J-drama since Rich Man, Poor Woman, and as always I find it refreshing how quick-paced and to-the-point they are. Seriously, getting to the equivalent part of the story in the Taiwan drama would probably take you multiple times the hours and lots of frustrating slowness, but here one long evening will do the trick. Playful Kiss is one of those manga stories I just have an undeniable affinity towards and totally get the popular appeal, even if it is slightly degrading and frustrating to watch the girl. For me, PK is all about Naoki, who is so ridiculously appealing that you can't help but get drawn into watching him slowly open up. Kotoko on the other-hand... I get she's the foil to his character, and I'll admit watching him fall for someone completely competent would negate the whole point of the romance, but seriously, girl needs to grow a brain. She does things that are so freaking stupid that they literally make the viewer cringe. I feel pity for Naoki in getting saddled with taking care of such an idiot for the rest of his life, but I still find their romantic moments cute. Of all the drama adaptations, I do think ISWAK was the most well-developed version. Of course, it's also the longest, and definitely has the slowest start. I almost dropped multiple times during the first few episodes when Ariel was out shrieking and crying like a banshee. However, they couldn't have cast a more perfect Naoki than Joe, who I inevitably compare all other Naoki performances to. He literally defined the man, and was about 90% of the appeal for that drama. Unfortunately, just as he was the best performance, Ariel still stands as the most annoying, most stupid Kotoko of all time. She gets moderately better as you progress, but watching her cry every few minutes and badger about with her high-pitched voice makes you want to physically strangle her, or at least replace her with a less stupid heroine. Back to the modern Tokyo incarnation, I don't think it qualitatively holds a candle to ISWAK, but it gets the job done. The main problem is that it literally feels like a recreation ISWAK, especially in the first couple of episodes. I was struck by how similar the actors look to their Taiwan counterparts, notably the guy here to Joe. Same sharp features, which makes sense then why they chose to cast this 25-year-old for the part. The beginning intro is literally ripped straight from ISWAK too - the two of them walking in the street, looking for each other while fending off the second-leads. Could they not have tried to develop something more original? As for acting, the characters are slowly growing on me, but the girl playing Kotoko needs to stop the overacting. The exaggerated facial expressions, the hand motions, annoying chirpy happy skipping - it's horribly awkward to watch. I also find her uncomfortably gangly, with her stick-skinny limbs and slight slouch. She's pretty, but she has none of the natural screen presence of someone like Ishihara Satomi. The guy playing Naoki is doing a decent job, though admittedly he doesn't have much to do except appear mean and pretty. I think he looks right for the part, and he has good chemistry with the girl despite their age gap. He's still pretty stiff in the role though, with a robotic line delivery that's just a tad over-the-top fake. I could care less for second-lead guy, and I wish they'd stop shoveling him into so many scenes. Unfortunately, the directing for this is incredibly juvenile, cheapening the whole production. There's too much use of shaky-cams, spin-around cams, zoom-ups, and general floating. It looks plain lazy, and reminiscent of an indie movie. I thought PK's directing was bad, but this is plain awful. I'm far from impressed with the drama overall, but might keep at it out of residual fondness for the story. The girl here is really giving Ariel a run for her money in terms of most-annoying Kotoko, and that just kills everything. 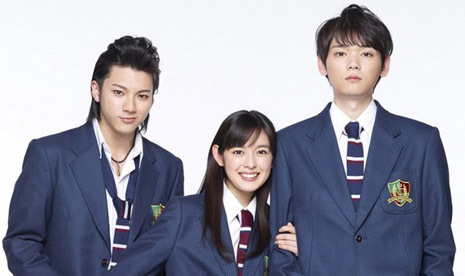 However, I generally really like where the story goes post-high school, and I've liked all of the previous second lead girls. Here's to hoping things pick up.